Who said a wardrobe malfunction has to be a bad thing? 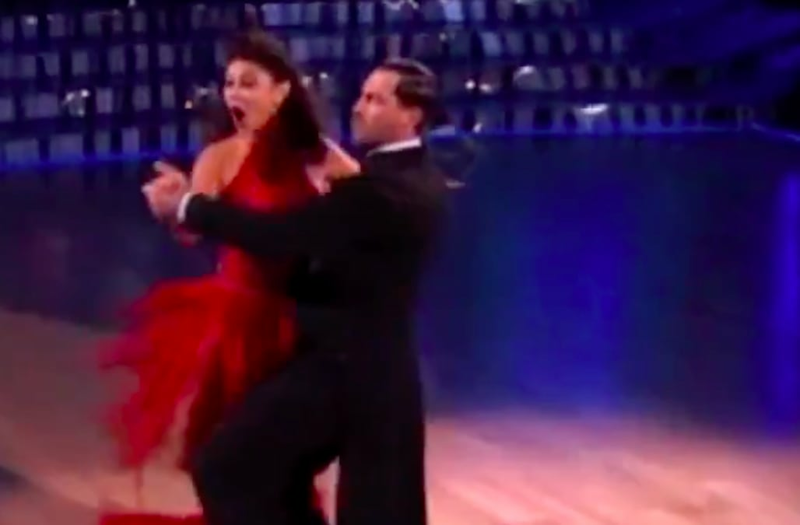 Vanessa Lachey suffered a skirt slip while performing the quickstep with her partner, Maksim Chmerkovskiy, during Dancing With the Stars' Night at the Movies on Monday, but you truly wouldn't have known it was intentional. Paying homage to classic musicals, the 36-year-old actress started off singing with her "Lachey Sisters" -- a take on the Andrew sisters -- before gliding into her choreography with Maks. Her pro partner accidentally stepped on her skirt as they passed by the judges, causing her longer silk skirt to fall to the ground. Vanessa handled it so gracefully, however, that the moment seemed planned. Not missing a beat, she hit all of her steps as she lip synced along to Smash's "Let's Be Bad." The judges clearly didn't see the missing costume piece as an error. 'DWTS': 'Week 6' Preview: Frankie Muniz, Mark Ballas & More Reveal Ballroom Strategies! As for Bruno, though he did note there was one minor foot hold he noticed, otherwise, he told Vanessa that she was "absolutely gleaming with that kind of theatrical, pizzazz, glamour of a ‘40s musical," adding, "You killed it. That was so delicious." Luckily, Len came around, agreeing with his other judges that the dance was worth a high score, with all four giving the duo 9s, adding up to a 36 out of 40. “This dancing thing is working out for me!” Vanessa joked just before she got the scores. Her husband, Nick Lachey, clearly agreed -- he was beaming after his wife completed her dance. But sadly, his number earlier in the evening didn't go quite as well. The second dance of the movie tribute, he and partner Peta Murgatroyd performed a steampunk-meets-Mad Max samba to "Wild Wild West," but the awkward, stilted number looked labored and only earned them a 26 out of 40, and they were ultimately eliminated from this week's show.